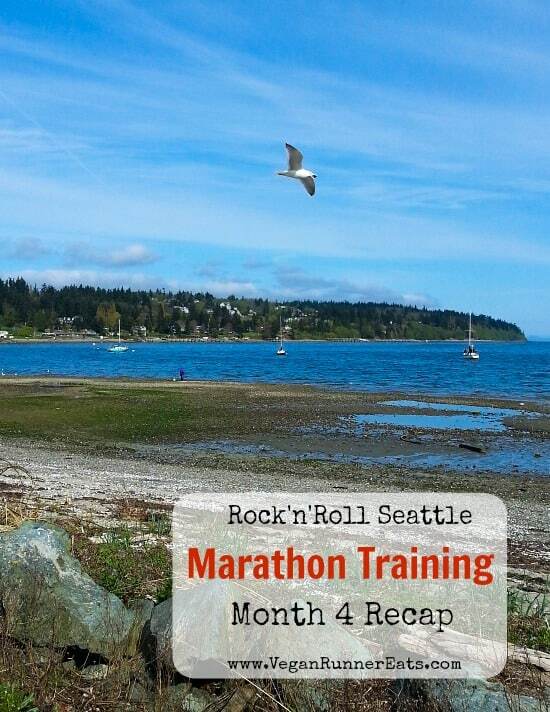 Vegan Runner Eats » Marathon Training » Month 4 of Rock’n’Roll Seattle Marathon Training: the Finish Line is Getting Closer! So I’m officially entering the final stretch of my training for Rock’n’Roll Seattle marathon, and today it’s time for me to share with you the highlights of my vegan training in month 4. To sum up this month, the training wasn’t easy, but I powered through it and came out on top! You may remember from my previous update that last month, my left shin suddenly started giving me trouble, so I had to cut down the mileage of one of my long runs and went on to skip running altogether the following week. I iced that spot and made sure not to load it during my regular strength training sessions at the gym, and by mid-week noticed that my shin wasn’t bothering me anymore. The following weekend, Rob and I flew to New York to see family, and I brought my running clothes and shoes to see if I could squeeze in a short run on Sunday. On Sunday morning, I successfully ran just under four miles, and thankfully, my left shin didn’t act up at all. Yippee! The following week, I resumed my training as usual – 3 weekly runs + 2 strength training days for a total of five workout days a week. *Note: Going back to running only after a week off to heal an injury worked fine for me in this particular case, but I don’t recommend anyone to follow my steps here. If you find yourself injured, please make sure to take more than just one week off, follow with more icing, and maybe even go see a specialist. 1. My long runs got longer and went mostly fine. In fact, they were just fine, but I’m adding ‘mostly’ because none of them were easy. My neighborhood is notoriously hilly, with this one gradual hill that spans over half a mile, and I have to conquer it every time I come back from running outside of this area. On a 12-14 mile run that hill happens in mile 11-13, but if I’m running 16 or 20 miles, boy does it make me feel the burn! Thankfully, I’ve been able to power up that hill without slowing to a walk even once, but my overall pace for that stretch of road goes down quite a bit. 2. I’ve noticed that I’m getting stronger and leaner all over. Okay, my looks don’t exactly matter for my performance – I’ve always said that what matters isn’t how our bodies look but what we can do with them looking like that – but it’s nice to get a visual cue that my hard work both in running and in strength training is paying off. At this stage in life, I don’t care to look ‘skinny’ – I want to look fit and athletic so that to shut up all of the naysayers who say that I can’t be fit on a vegan diet. 3. My recovery from long runs has been pretty good – so good, in fact, that I’ve been fitting in a full-body strength workout the day after my long runs, and it feels just fine! For the longest time, I subscribed to the notion that you have to have a full rest day on the day following a long run. I’ve been doing my long runs on Sunday morning, and by Monday evening I feel fully rested, so doing nothing exercise-wise rubs my gym-rat self the wrong way. So a few weeks ago, I did an experiment of having one of my regular strength workouts on Monday after work, and it felt fine! Since then, working out on Monday night has become a part of my routine. However, I do take a full rest day on Tuesday. Also, I did take a full day off after my recent 20-miler. 2. My body is handling the longer runs mostly fine, but my left foot – the one that had plantar fasciitis for the most part of last year – sometimes acts up a bit for a few minutes at a time during running. The pain is not so bad that I can’t tolerate it or have to reduce to a walk, but it’s mostly a reminder for me to pay more attention to how my feet land on the ground. 3. My lower back has been another cranky area during long runs. I’ve figured that it acts up because as the distance progresses, I get tired and lose form, start slouching especially on uphills, and end up with a sore lower back. During the past couple long runs (including the most recent 20-miler) I paid more attention to having my shoulders up and back to prevent slouching, and that mostly helped. The only goal I set last month was to come back to running after my left shin started giving me trouble, and thankfully, it worked out fine. Also, I was able to successfully raise my long run mileage from 12 to 20 miles. Sundays – long run outside. Distance for each Sunday in month four: 14.5 mi – 16.1 mi – 13.5 mi – 20 mi. The idea of having only 3 running days goes against the existing conventional wisdom on marathon training, but it seems to be working fine for me. I said before that at this time in my life, I enjoy strength training too much to cut it down to less than 2 times a week/less than 1 hour per session and fit in more running. Plus, I know that my body can become injury-prone, so if I start raising mileage or speed and allow for more running days, I just might do myself a disservice. *Note: If you’ve been following my marathon training updates in search of inspiration for your own training, please note that your body may benefit from running more than I’ve been doing – it’s very individual. During my two shorter weekly runs of 5-6 miles, I continue to bring a hand-held bottle of plain water with me, and sip it as needed. On my longer runs, I’ve been adding an electrolyte pill to a 24-oz water bottle with a few ice cubes, and consuming an energy gel every hour of running (so far it’s been just 2 gels for my 2-3 hour-long runs). I’ve also noticed that I lose a lot of salt with sweat – so much that I have salt streaks on my face when I get back home. Towards the end of my long runs, I start craving something salty instead of the sweetness of energy gels – another sign of my electrolyte balance being thrown off. So on my most recent 20-miler, I added a pinch of sea salt to my water bottle in addition to a sweet electrolyte tablet, and it seemed to make me feel better in the later miles and reduced my salty cravings. *Please note: I don’t suggest that everybody should add salt to their water on long runs though, please use your own judgment. 1. To ‘take it easy’! Now’s the time to scale down on the intensity of my workouts, especially my strength training sessions that usually make me quite sore the day after. I’ll focus on growing muscle and getting stronger after the marathon is done! 2. To have two more long runs (a 14-15 miler this weekend and a 10 miler the week after), and to switch them from Sundays to Saturdays in order to get used to the marathon happening on Saturday (June 13th). 3. To continue stretching and foam rolling after running, and not to attempt anything crazy. One thing I have to admit: my recovery from each and every hard workout has been impressively quick, and I fully credit my plant-based vegan diet for that. There have been plenty of factors that could have compromised my recovery this marathon training season – not getting enough sleep, working a full-time job, dealing with the stress of moving into our new house midway through my training – but I still managed to have quality workouts that didn’t make me skip a run just because I was too sore/tired. And now, I’ve got to ask you one thing: if you have any questions for me regarding my marathon training, recovery from hard workouts, nutrition, and just about anything running-related, please ask me either here in the comments, or email your questions to me at veganrunnereats (at) gmail (dot) com. I’ll pick a few questions from readers of Vegan Runner Eats and do a Q&A post right before the marathon (two weeks from now). So anything you’d like to now about running, training, and balancing them with life – please don’t hesitate to ask! 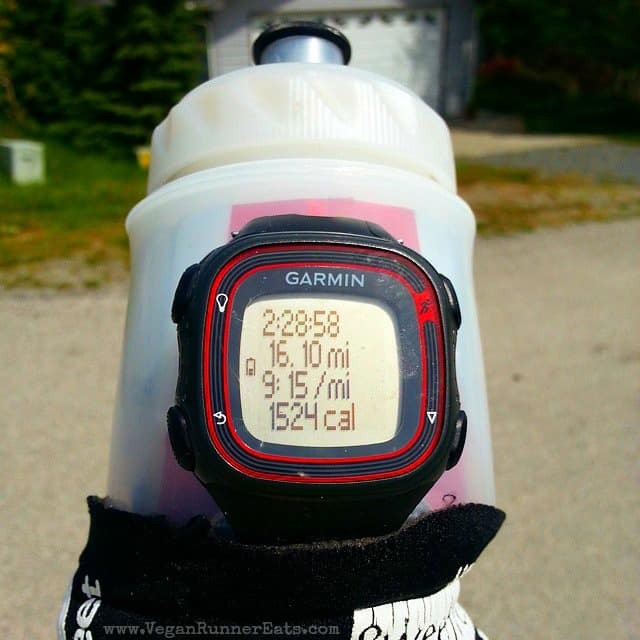 In case you’ve missed my previous marathon training updates, you can see them all over here. Tagged injury, marathon training, recovery, Rock'n'Roll Seattle Marathon, running tips. Bookmark the permalink. 9 Responses to Month 4 of Rock’n’Roll Seattle Marathon Training: the Finish Line is Getting Closer! Love your updates! Miss you – and wish you all the best for your run. Would love to chat after the race so you can fill me in – maybe a long walk!? I could meet you during one of your breaks at work? Hi Melene! Thanks for stopping by, miss you too! I’ll email you my thoughts about that soon. I’m glad to hear what you’re doing is working for you – that’s always the best approach. And I’m glad the plant-based recovery is working for you too. 😉 Keep up the good work… exciting, you’re almost there! Thanks The Vegan Junction! Yes, I can’t wait for that finish in a couple weeks! Your training sounds very similar to mine although I’m a couple of months behind you (my marathon is in August, in Iceland). Three runs a week (tempo, speed intervals, long run) and in my case three days strength and cardio training at the gym. I’m glad to hear someone else doing something similar and feeling happy with the results. About the salt thing – and as another vegan – I tried salted sultanas on a long run aaaaaaages ago, in training for my first half marathon, and it’s fantastic. Just add a little coarse sea salt to a big handful of sultanas and mix well, till you can see salt on them all but they’re not covered. Nom during late stages of run. Easy, and a simple little taste sensation when you’re ten miles in the hole and your whole body is telling you weird things. That’s a great idea, Kat, thank you for sharing! I’ll admit though that I had to Google to see what sultanas were, and they turned out to be raisins. Good luck with your marathon training! Some of those hills around Freeland are tough! We used to love running by Holmes Harbor and looking at the boats being worked on at Nichols Bros. I don’t know if this is something you’d want to try, but my hubby and I have used Electrolyte Replacement pills/tablets on long runs. I don’t know if I can say a brand, but you can find them in most sport shops or online. They work great for us. Lets see, a question about your training…..does your hubby ever run with you? Hi Heidi! I love running by Nichols Brothers, the views of the harbor are always so beautiful! I just ran there this morning. As for electrolyte pills, I’ve been using some by the GU brand but found that the resulting drink works even better if I add dome salt to it. And thank you for the question! Rob doesn’t run with me – he prefers cycling, and I’m terrified of bicycles, so each of us does what we like better. I’ll elaborate in the upcoming post!